With 20 years’ experience of commercial project success, you can trust us to deliver and exceed expectations. Iron Age Manufacturing is a team full of pride. Pride in our work, pride in our service and pride in our relationship with our clients. That’s why we never promise anything we can’t deliver. With us, your job doesn’t just get done right the first time, it’ll retain its appearance and functionality for years. We promise, with pride. Our highly experienced staff calls on over two decades of service in the metalworking industry to deliver on-time, on-budget work for our commercial clients. We are Canadian Welding Bureau Certified, and we’re also a proud member of the Vancouver Regional Construction Association. In addition, we believe in making sure we stay up on recent developments in our industry, so we can provide our clients with the latest and greatest design help, products and services. We invite you to take a moment to look at a few examples of our work here, and then contact us for more information on how we can help you move forward with your project. When the British Columbia Institute of Technology (BCIT) asked us to create a safe and attractive railing to wrap around the top of one of their buildings, we didn’t hesitate. Our custom designed exterior structural guard railings allow for secure access to the rooftop while maintaining the modern look of the building. It was important to have minimal disruption for the students studying during the day. It was integral to protect the surroundings because site welding was required. It was a tight deadline and rain could have hampered the pace, especially for our on-site welder. As it was done overnight and, on the roof, extra precautions needed to be incorporated. We opted to work overnight and after hours, to minimize disruption. Extra measures were incorporated to accommodate the extra protection required. A cover was brought in to ensure no delays occurred. Lighting equipment was brought in and our welder was in safety harness gear, in order to work safely in the dark. We may not be able to compete with the natural beauty, but we’re excited to have shared a small part in making the VanDusen Botanical Gardens the stunning landmark it is today. Working carefully with the client’s Designer, we designed, advised and worked up specific technical information to support the overall design. Traffic control was tricky, due to this being a public installation. A restricted time limit and a unique design made for challenging conditions. 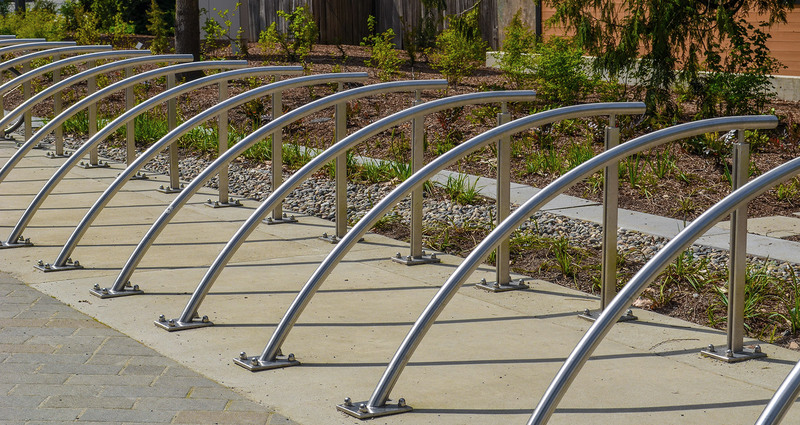 A variety of installations were done including: stainless steel bike racks, a water feature and cable railings. By regularly communicating with our client, we were able to deal with any surprises efficiently. Working closely with the City of Vancouver we were able to ensure traffic control ran smoothly. By consulting with the Designer before and during the project, the appropriate information was exchanged. When you’re offered the opportunity to design, build and install an exterior staircase on a heritage hotel, you don’t refuse because it’s an opportunity of a lifetime! Which is why we were thrilled to replace the escape spiral staircase and match the stairs to the antique style of the West Hotel. To ensure safety while maintaining the integrity of the design. Managing to build and install while limited on space, in a very narrow alley. We needed to lift parts up the narrow back alley, as part of the project. Managing the work while in a very high traffic zone of downtown Vancouver. We created special brackets to anchor into the old brick. By carefully planning our installation and design, we were able to deal with the lack of space without issue. By collaborating with other contractors, we were able to tackle the difficult task, smoothly. Working closely with the City of Vancouver, we were able to manage the traffic difficulties. Preparing for risk and building a safety management plan for this project was the key to our success. Commercial Project on Your Mind? If it can be made from metal, we’ll design, manufacture and install it! We love a challenge, too. So, if you’ve got an idea let us know, we can help.